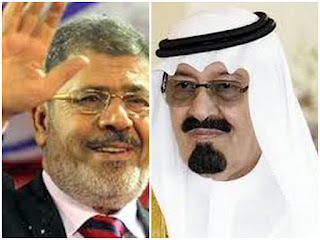 During his state visit, Morsy, a leading figure in the Muslim Brotherhood, will hold talks with King Abdullah and Crown Prince Salman and also perform the Umrah, the non-mandatory lesser pilgrimage to Mecca that may be performed at any time of the year. 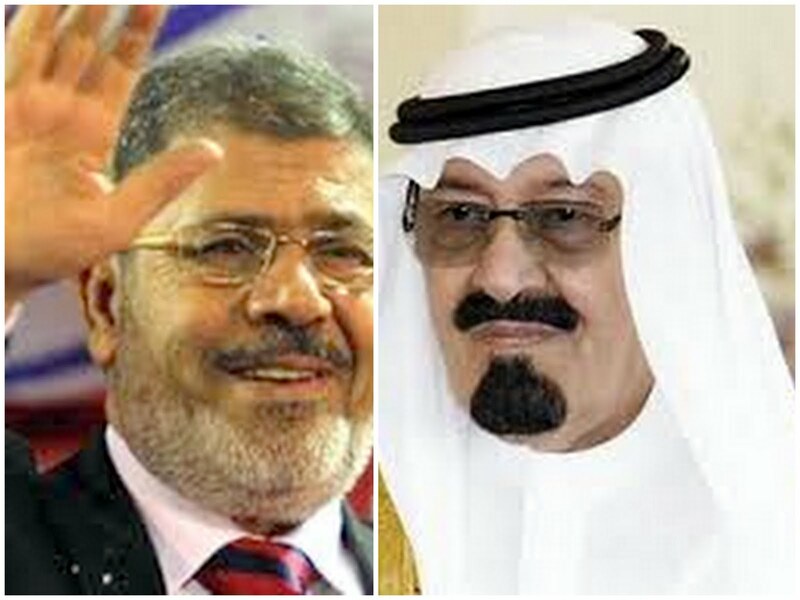 Saudi Ambassador to Egypt Ahmed Qattan delivered King Abdullah’s invitation to Morsy last Saturday. Qattan said the visit would enhance bilateral relations in all domains. A curtain raiser on the visit published today in the leading Saudi daily Asharq Alawsat says bilateral trade between the two states stood at $4.75 billion in 2011 while the value of Saudi investments in Egypt reached some $27 billion. The Saudi investments are in 779 Egyptian projects, of which 381 are in the mining and industry sector, 117 in agriculture, 156 in services and 94 in tourism. Other revealing figures show Saudi Arabia hosting 1.7 million Egyptian expatriates (including Morsy’s son Ahmad, who is a medic based in Ahsaa). At the same time, some 700,000 Saudis are residing or studying in Egypt, which draws another half a million Saudi tourists annually. In a flashback on Saudi Arabia’s relations with Egypt’s Muslim Brotherhood, Asharq Alawsat publishes a 1936 photo of King Abdulaziz Al Saud receiving Brotherhood founder Hassan al-Banna at a Muslim forum in the wake of the latter’s pilgrimage to Mecca. A serious dip in relations between Saudi Arabia and Nasser’s Egypt (presumably over the 1962-1970 North Yemen Civil War) under King Feisal saw the kingdom open its doors to large numbers of Muslim Brothers. 1. Demise of the Mubarak regime, which had excellent ties with Saudi Arabia, and the transition to a “Brotherhood republic” won’t affect the mainstays of the Egyptian-Saudi partnership, which is based on facts and mutual interests rather than on specific individuals. 2. Smart Saudi diplomacy was able to abort Iran’s drive to host Morsy on his first foreign visit as president before the conference of the Non-Aligned Movement in Tehran at the end of August. 3. Heal the diplomatic spat over the Gizawi affair (See my April 26 post, “Saudi Arabia, Egypt and the suspected drug mule”). 4. Allow Riyadh to gauge the Egyptian president’s views on three principal issues: (1) The export or dissemination of (Brotherhood) ideas and experiences abroad (2) The ruling Brotherhood’s position vis-à-vis Iran and (3) How the president intends tackling the Hamas, Hezbollah and Israel files. 5. Determine the size of Saudi financial support Egypt needs to put its economic house in order, restore confidence in its markets and win back foreign investors.